Bra'tac arrives with word that Apophis has attacked Chulak, searching for the Harsesis, his child by Shar're/Amaunet. The forbidden child contains all the knowledge of the Goa'uld, and was hidden away by Sha're on Kheb. 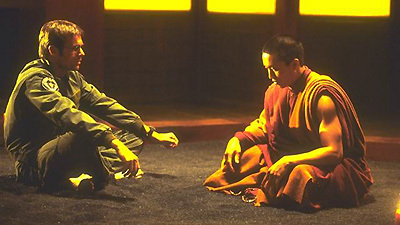 SG-1 travels to Kheb and finds a serene world with an enigmatic monk who guides Daniel through a spiritual awakening. In his enlightenment, he meets Oma Desala, an ethereal being who is caring for the Harsesis. She holds unimagined powers as well, and it is she who destroys the pursuing Jaffa armies before carrying the infant Harsesis away through the stargate to safety. Chulak was attacked and destroyed by Apophis, searching for the Harsesis child. Moac, Bra'tac's newest apprentice, died from injuries received during the battle. Bra'tac, now 135 years old, is approaching the age when he can no longer carry a prim'ta. In Earth mythology, Osiris once hid from Seth on Kheb. In Jaffa legend, Osiris hid on a planet of the Loc'na ko, a group of planets whose resources were depleted by mining. The SGC database includes stargate address references from both the Abydos cartouche (indicated in yellow, including the Loc'na ko) and the Ancients' original map fed into the computer by O'Neill (indicated in red, and including Kheb). SG-2, under Major Coburn, acted as backup to SG-1 on the mission to Kheb. Kheb, an untouched wilderness with great mountains and a single temple in a valley distant from the gate, is a world feared and despised by the Goa'uld. According to ancient legend it was discovered long ago by a few Jaffa and kept secret from the Goa'uld. When a Jaffa could no longer carry a prim'ta, he would make the journey to Kheb where his kalach (soul) would learn the path through the darkness into the next life. When the Goa'uld learned of Kheb and travelled there, they did not return, and so it was forbidden to speak of it. The temple on Kheb was built by an alien race millennia ago who may have visited Earth and inspired the mythology surrounding the concept of Mother Nature. They discovered a means of ascending to some higher ethereal plane of existence and went there, leaving the writings on the shrine as a guide for others to follow. The Monk spoke in Zen koans, suggesting that the theology of Kheb may have been an original basis for Buddhism on Earth. "Oma Desala" means "Mother Nature". Well, somebody's been reading Martha Stewart. Whoa, slow down there, Grasshopper.